In an effort to leverage social media to match skilled job hunters with strong positions, Facebook has launched a social jobs app designed to make it easier for people to use Facebook to find and share employment opportunities. The app was developed in conjunction with the recently created Social Jobs Partnership (SJP), which was an initiative to promote social media as a business networking tool to connect qualified candidates with quality jobs. 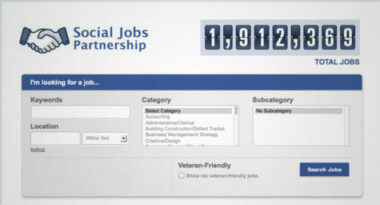 The SJP was a collaborative effort among the U.S. Department of Labor with various employment organizations and many top career websites such as Monster.com and Jobvite. Mashable.com offered a look at how Facebook’s latest jobs venture could help the network further broaden its scope of social services and position the company as a major competitor to other career-focused social media sites. There are currently more than 1.9 million jobs accessible on this new Social Jobs app. This volume of opportunities, along with its user-friendly functionality, should help the Facebook attract a large number of job seekers and employers alike. Positions are searchable by skill, industry, location, and keyword with results gathered from all of the partnering career sites. In addition, military veterans are able to search for special veteran-friendly opportunities. Interestingly, Facebook may have planned for its progression into a social business engine with the Job Hub created by the company last year. This online hub housed educational content and tools from the very organizations that partnered with Facebook for the launch of the SJP. At the time, analysts speculated that it was only the first step toward the network’s development of a massive jobs board and their predictions proved correct. Looking forward, it is assumed that Facebook will leverage its new Social Jobs app to grow its gigantic user base even larger. There is no denying the appeal of pairing the popularity of social networking with the tremendous need for employment opportunities, especially when people are trying to find work in challenging economies worldwide. This opens the door to the possibility of Facebook posing a threat to LinkedIn’s stake and status as the leading business social network. LinkedIn has invested many years and countless dollars in forging relationships with headhunters and developing advanced tools for its business-minded community. For Facebook to become a viable competitor, its Social Jobs app would need to evolve beyond a listing of positions from various job engines to offer a range of valuable resources for both candidates and companies. While this would take time and effort to develop, LinkedIn should definitely be concerned since their stock already fell following the announcement of the news. In addition, Facebook has repeatedly expressed its desire to expand its array of services to meet the ever-evolving needs of users and this new Social Jobs app shows how the social media network means business. To incorporate the power of Facebook into your social media marketing strategy, contact MDG Advertising. At MDG Advertising, a full-service traditional and digital marketing agency with offices in Boca Raton, FL and New York, NY, our 360° marketing approach uses just the right mix of traditional and online media to reach your marketing goals. While some industries may fare better in print and others online, we strive to create a balanced approach where traditional and digital marketing efforts support each other and your message is tailored to the medium. To stay on top of the latest trends in Facebook advertising, contact MDG Advertising.